A new book highlighting places of interest in Logan and Cache Valley is being released this week. 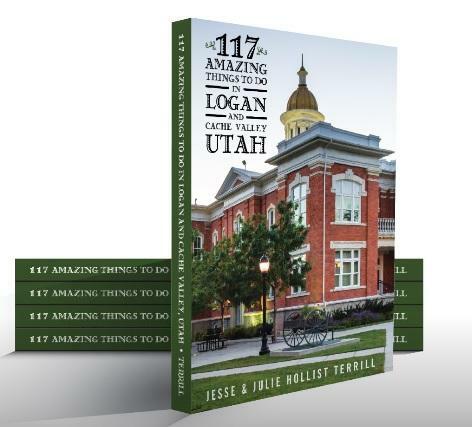 The travel guide, 117 Amazing Things To Do In Logan and Cache Valley, Utah, explores obvious and hidden attractions. It is an unusual number, the number 117. Why choose an odd number when making a list? "After I kinda finished at 117, then I kept thinking of more, then I was like 'hey, I've gotta stop somewhere', so we stopped at 117." Julie Hollist Terrill is director of the Cache Valley Visitor’s Bureau. Together, she and husband Jesse have compiled a 5x7 book divided into different sections including outdoors, the arts, celebrate, beyond, shopping and adventures. There are suggestions of places to visit if you are interested in locally produced food products, hiking trails, or a walking tour featuring unique headstones in the Logan Cemetery. "One of the headstones, the lady put her fudge recipe on the back of her headstone," Terrill said. "Most people are like, 'I'm going to take that to my grave', but obviously she wanted everyone to know." The idea to design and print a hard copy version of a list she typically mentions as she promotes tourism happened this past summer after a group of summer citizens wanted to explore the area like locals. "You know, any day you could just flip to a page, stick your finger on it and go, ‘This is what adventure we are doing today,’" she suggested. "And I hope people can use that and maybe even write in the margins who you are with and just a couple of things about it, and it could just become a journal about your exploration of Cache Valley. I think that would be treasured and it would be kinda cool." "I do love this valley," Terrill said. "And it really is my hope that people who live here will get out and explore it and love it and enjoy it because it is fabulous. I think it shocks people when they find out that people literally come here from around the world, on purpose, because of the amazing things we have to do here. The first printing of the book is due to arrive in Logan this week. Terrill says hundreds of customers have already purchased the Cache Valley guide online.